TOURISTS to Malaysia, and Johor in particular, will soon be spoilt for choice when it comes to high-end accommodation because Themed Attractions Resorts & Hotels Sdn Bhd (TARH) has scheduled several notable launches in the coming eight months. Upcoming openings in southeast Johor include four branded accommodation in the form of The Westin Desaru Coast Resort, Hard Rock Hotel Desaru Coast, One&Only Desaru Coast and Anantara Desaru Coast Resort & Villas. In southwest Johor, a new attraction — Sea Life — will debut in Legoland Malaysia Resort. Also on the cards is the reopening of luxury resort, The Datai Langkawi, in Kedah. Also worth noting is the debut of two components of Desaru — Desaru Coast Riverside and Desaru Coast Adventure Park — on June 30 and July 19 respectively. These new five-star, luxury and ultra-luxury accommodation and attractions are expected to boost not only the number but also the quality of tourists, thus potentially reversing the declining trend in arrivals and lower-than-expected tourism earnings. Recent data reveals that Malaysia is losing its competitiveness to other destinations and has failed to attract the targeted number of arrivals or see the projected spending. In an interview with The Edge, TARH’s newly appointed group CEO Amir Hamzah Azizan talks about how distinct products can help put Malaysia back on the map for global tourism. In this regard, he says much of the focus will be on developing and delivering Desaru Coast and The Datai in Langkawi by curating integrated resort destinations and hotels that will provide unique experiences. Desaru Coast, for example, will be developed to compete with destinations such as Phuket, Krabi and Bali, and to stand out as an alternative place for holidaymakers. A RM4.5 billion project on 3,900 acres, Desaru Coast will be completed in three phases over 20 years. Developed by Desaru Development Holdings One Sdn Bhd (DH One), it will be the country’s first integrated premium destination resort. “This is a big year for us,” declares Amir, who joined TARH, the hospitality arm of Khazanah Nasional Bhd, eight months ago. Phase 1 of Desaru Coast covers 2,000 acres and includes the infrastructure and road connections as well as two stunning golf courses, a theme park, a retail village and four hotels. A 27-hole golf course designed by Ernie Els was inaugurated in 2016 while an 18-hole golf course designed by Vijay Singh was opened last year. This was followed by the launch in June this year of Desaru Coast Riverside, which offers 21 restaurants and retail outlets, and an amphitheatre. In July, The Adventure Waterpark opened its doors and its more than 20 attractions are expected to draw 500,000 to 600,000 visitors by the end of next year. “Apart from that, we have the Hard Rock, Westin, Anantara and One&Only [opening soon],” Amir says. The four hotels will offer a total of 800 rooms out of a planned 4,000 to 5,000 rooms in Desaru Coast, which has been positioned to attract a more international (tourist) base and to provide the catalyst to kick-start Desaru as an integrated resort and to create spin-offs. Desaru will not compete in the two and three-star hotel space. For example, online reservations for November show rates of RM900 onwards for a night at The Hard Rock Desaru. The Hard Rock is 100%-owned by TARH while Westin is a joint venture between TARH and DH One. The latter is jointly owned by Johor and other local parties. According to Amir, enquiries have already started to pour in for these two hotels, especially from those keen on a destination wedding. As for Anantara — a 60:40 joint venture between Minor Hotel Group (the hospitality unit of Thailand-listed Minor International PCL) and TARH — it will be ready in the first quarter of next year. The ultra-luxurious One&Only brand, which operates the popular Atlantis The Palm Dubai, will throw open its doors earlier as it is scheduled to open by the end of the year. Both Anantara and One&Only are making their first foray into Malaysia. One&Only replaces an earlier planned Aman Resort Desaru Coast, although the owner — a joint venture between DH One and Bacharach Holdings Ltd, a subsidiary of Symphony International Holdings Ltd — remains the same. “One&Only’s philosophy is similar to TARH’s,” explains Amir, who hopes to draw new investments to smaller attractions, such as rock climbing and mini golf, by the end of the year. To draw workers to Desaru, TARH has added a staff village that can accommodate 1,700 people. Phase 1 of Desaru Coast will also comprise residential projects. “We have a partnership with UEM Sunrise and we are hoping to see launches in the latter part of this year or early next year. Subsequently, other phases will come in, including residential and serviced apartments,” he says. In Phase 2, the plan includes building a ferry terminal that will be ready in early 2020. “Construction of the ferry terminal has already begun. 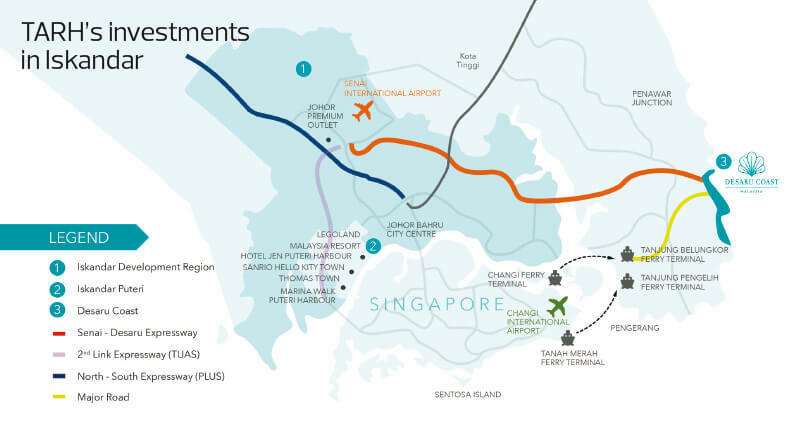 That is an important connection that allows us to ferry from Tanah Merah (located near Changi Airport in Singapore) directly to Desaru. When we do that, the journey will be shortened to just an hour. With that, we are also looking at adding a marina,” Amir adds. Phase 2 will bring in more retail space, hotels, serviced apartments and residences, and “other concepts such as wellness or retirement villages”. In the final phase, elements under consideration include luxury camping or glamping, as well as nature tours, bird-watching and hiking. “This is not a five-year but 20-year journey. Phase 1 is the catalyst, and the key for us is we do not want to kill (it) by accelerating (the developments). We want to curate it as the market comes up,” Amir remarks. When TARH began its journey in Johor in early 2000, it planned to introduce 5 of the 11 attractions in the state. The plan was for Johor, together with Singapore, to be transformed into Asean’s attraction capital and family destination or the “Orlando of Southeast Asia”. Eight years on, and minus a few theme parks, TARH has moved away from that thrust. “Do we need to put in a fancier theme park? It could be something that we will explore but at this moment, the priority is to deliver Phase 1. In order to make this position (theme park capital) work, we have to connect the various experiences that exist in Johor and Singapore. “Malaysia has a lot more to offer. Over time, when the ferry terminal and marina come up, we will have to look at how we (can) open up the destination (to include) the local islands. That type of curation is a stronger push for us than purely saying this is a theme park capital,” Amir explains. Nevertheless, he acknowledges that theme parks help create a buzz and draw crowds. Since the opening of Legoland in 2012, TARH has chalked up a total of 14 million visitors at its six attractions (including KidZania Singapore), half of them foreigners. “Theme parks help the destination but they are not the be-all and end-all of it. We do not want Desaru to become overcrowded like Phuket. If it gets to that level, you could see diminishing returns,” says Amir, whose goal is to offer a great family holiday in Desaru as a whole and not just a single element, such as a hotel. Expanding the target market will lead to more tourism dollars. As for TARH’s other attractions, Amir describes the performance of the six-year-old KidZania Malaysia as “decent” while improvements are being made to its Singapore outlet to draw more visitors. Based on the latest filings with the Companies Commission of Malaysia, in its financial year ended Dec 31, 2016, TARH incurred a net loss of RM52.41 million on revenue of RM38.29 million. Accumulated losses stood at RM95.49 million while total liabilities, all current, totalled RM20.18 million.